Highlight the merchandise that you have available for your customers with these White Wire Grid Panels. The stunning white finish looks great, and will easily attract and catch the eyes of your customers. 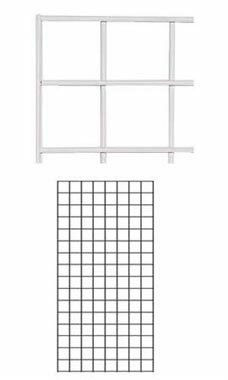 Measuring at 2' x 4', these panels are perfect for smaller sized items, but can still easily display large items. This piece is made of wire that is spaced out every 3", and is very durable and sturdy. The extra double wire along the outside of this structure is perfect for additional support. These panels must be ordered in increments of 2 panels, due to packaging and shipping. In stock and available for same day shipping as long as you place your order before 3 PM. We have used the 6' grid on the wall and free standing. We are now installing the 4'sections over a low table to increase our display and merchandising options. It's a very clean look for our boutique. The grid help to successful organize merchandise.in awkward spaces. These were great! I returned my items with no hassle and was able to order the correct size grid panels. They arrived the very next day and were perfect. Very nice wire grid. Using them for displaying our photo letter art in a mall.